With the end of September comes the dreaded Carmageddon II, in which crews will demolish the other half of the Mulholland bridge over the 405 freeway, shutting down the 10 miles of roadway through the pass from the 10 Freeway to the 101 Freeway. Back for the original Carmageddon (which really didn&apos;t bring L.A. to its knees as perhaps imagined), JetBlue came up with the nifty idea to help people beat the alternative driving routes, and just fly from Burbank to Long Beach, replacing the valley-to-port commute on the 405 with $4 (each way) flights between the popular small airports. So will the PlanePool be helping Angelenos fly #OverThe405 again September 29-30? Hey @jetblue, so Carmageddon II is coming to LASept. 29-30. 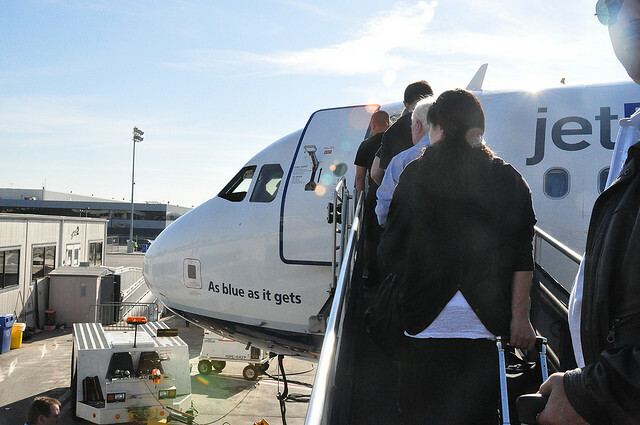 Will you be offering those awesome LGB-BUR direct flights again? Of course, last year, the JetBlue flight prompted a unique challenge from local bike riders; the Wolfpack Hustle challenged JetBlue to a race. The bike riders won, so, hey, if JetBlue doesn&apos;t offer those same special one-weekend flights, you can always make the same trek more expediently pedaling on two wheels. UPDATE 8/2/12: We reached out to JetBlue to see if they were considering doing the flights again, and haven&apos;t heard back received this response: "We have heard the Carmageddon II news, but like any good chef or magician, we can&apos;t reveal any secret sauce we might have in the works!"